Box of 25 assorted filled chocolates. Our pursuit to create true couverture chocolates with the most unique flavour combinations has led us here. 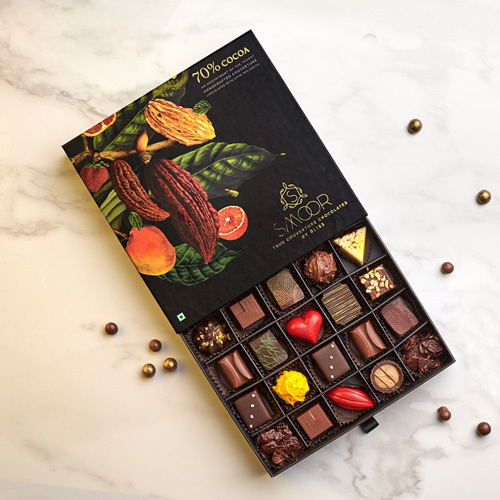 These chocolates are prepared by our skilled artisans using the finest quality chocolate, different flavours and nuts with a texture that melts in your mouth. At our website, you can easily Order 25 Piece Chocolate box online. Chocolates are loved by all age groups since forever, you can’t go wrong with this. 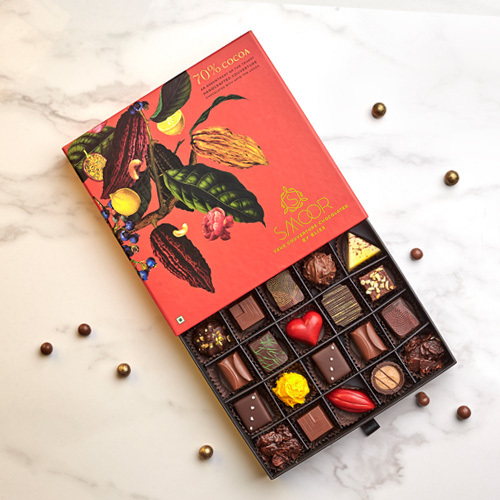 Whether it is gifts for your family, friends, girlfriend or boyfriend, Order luxury chocolates online with Smoor Bangalore. With our hassle free delivery process, we make your online chocolate shopping experience better. You can send chocolates all over the country and for residents in the city; we have online chocolate delivery in Bangalore available as well.